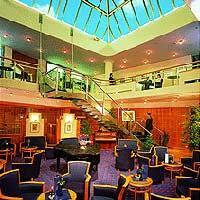 The Mercure Kapuzinerberg is located northeast of the Old Town, near the city center. This Salzburg hotel is within easy walking distance from several famous places of interest, such as Mozart's birthplace, the Mirabell Castle and Gardens, the Salzburg Cathedral, St. Peter's Monastery, and the Salzach River. The Salzburg airport is a short drive from the Mercure Salzburg Kapuzinerberg. Taxi services and public transportation are easily arranged. Many attractions are within walking distance, and bicycle paths are plentiful throughout the city. Each of the 139 well-appointed guest rooms offers an en suite bath with hair dryers and complimentary toiletries. The Mercure Kapuzinerberg Hotel Salzburg provides satellite television, alarm clocks, Internet connections, mini-bars and coffee machines in each room. Many modern amenities are available at the Mercure Salzburg Kapuzinerberg Hotel, including a bar and restaurant located on site. Business traveler may use one of several meeting spaces and high-speed Internet connections. A fitness center includes a spa, sauna, and solarium. The 24-hour front desk service offers a concierge, laundry facilities, and valet.